Apple CEO Tim Cook has no time for white supremacists and neo-Nazis. He made it pretty clear in a powerful note to Apple employees, which also slams Trump's "moral equivalence" between Nazis and human rights demonstrators. In the email, obtained by Recode, Cook also announced the company would make contributions of $1 million each to the Southern Poverty Law Center (SPLC) and the Anti-Defamation League. Apple plans to match its employees' donations to these and other human rights groups on a 2-for-1 basis, until September 30. Moreover, in the coming days iTunes will offer users an easy way to join the company in directly supporting the work of the SPLC. "I disagree with the president and others who believe that there is a moral equivalence between white supremacists and Nazis, and those who oppose them by standing up for human rights," Cook wrote. "Equating the two runs counter to our ideals as Americans." Cook's blistering attack on Trump comes after as business leaders such as the heads of 3M, Campbell Soup, Johnson & Johnson, and United Technologies announced their resignations from advisory councils on Wednesday in protest against the president's comments about the violence in Charlottesville. As a consequence, the president said he is scrapping two business councils, the Manufacturing Council & Strategy & Policy Forum. 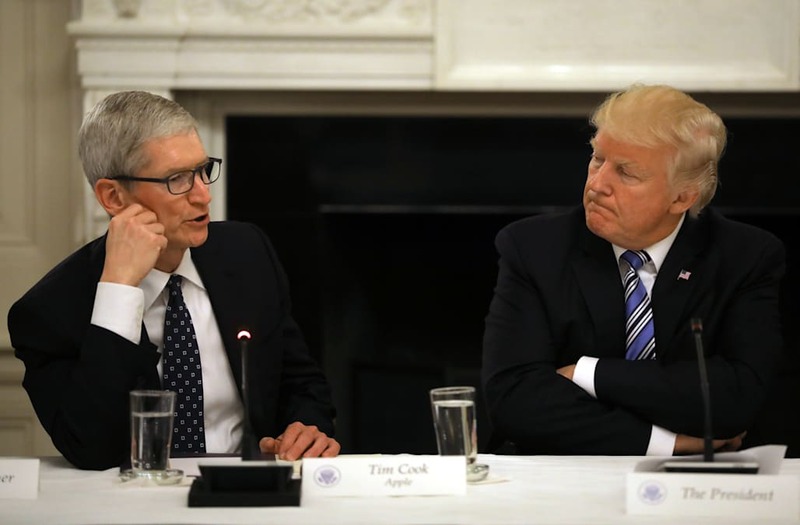 More recently, Apple has warred with Trump in debates over immigration and climate change. Behind the scenes, however, Cook has labored to shape the Trump administration's policies on issues from tax reform to lesbian, gay, bisexual and transgender rights, sources previously told Recode. Cook has sounded off not only with the president individually but also his top advisors, like son-in-law Jared Kushner and his wife, Ivanka. Like so many of you, equality is at the core of my beliefs and values. The events of the past several days have been deeply troubling for me, and I've heard from many people at Apple who are saddened, outraged or confused. I believe Apple has led by example, and we're going to keep doing that. We have always welcomed people from every walk of life to our stores around the world and showed them that Apple is inclusive of everyone. We empower people to share their views and express themselves through our products. In the wake of the tragic and repulsive events in Charlottesville, we are stepping up to help organizations who work to rid our country of hate. Apple will be making contributions of $1 million each to the Southern Poverty Law Center and the Anti-Defamation League. We will also match two-for-one our employees' donations to these and several other human rights groups, between now and September 30. Dr. Martin Luther King said, "Our lives begin to end the day we become silent about the things that matter." So, we will continue to speak up. These have been dark days, but I remain as optimistic as ever that the future is bright. Apple can and will play an important role in bringing about positive change.